Using the principles of light, University of Leeds scientists have discovered a new way to measure the strength of modern forms of concrete - giving industry a better way to understand when it could fracture. Their approach was based on applying a complex light-refracting coating, designed to display stress positions, to the surface of concrete beam samples. The epoxy coating is 'birefringent' - it has the ability to split light waves in different directions in relation to the amount of stress acting in those directions, and reflecting back to a photonic camera. The camera then takes a picture showing where the stress levels are most extreme before cracks or fractures occur. 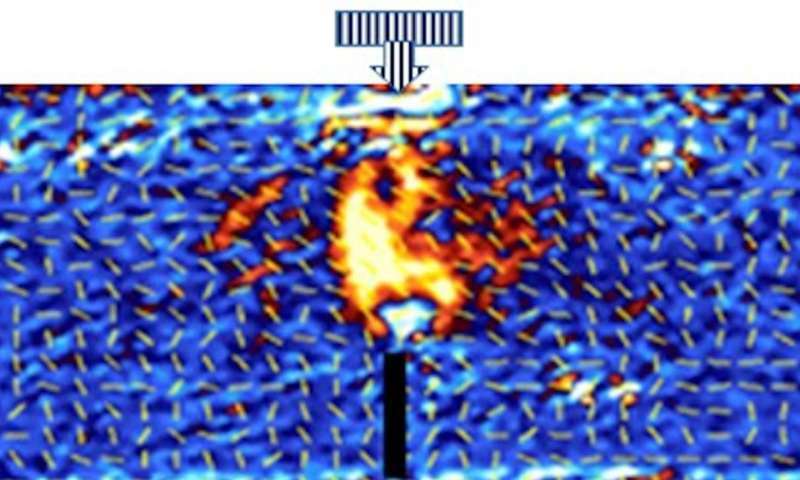 While the coating itself is not new, this research project was the first time it had been used to measure shear stress and assess concrete toughness against fractures. Dr Joseph Antony from the School of Chemical and Process Engineering at the leading Russell Group UK university, who led the study together with researchers at the University of Qatar, said: "There are other methods to measure stress and strain levels in the engineering sector, but we do not believe any of them can measure shear strain directly with high precision, which is most relevant to assess the failure strength of materials. "The photonic method we developed can directly measure sheer strain, even on opaque materials. Until now, photonic and optical methods of measurement have only been associated with transparent materials." The results using the new method compared favourably with conventional methods of stress testing, which have relied on combined experimental and numerical or analytical approaches. The rise of composite concretes now used extensively in the construction industry prompted the team to look for new ways to study the material's strength. Concrete has traditionally been made with cement, gravel and sand but has changed significantly in recent decades. It can now include numerous waste products including plastic pellets, in order to reduce the levels of natural materials used and to recycle waste products. Dr Antony added: "Our study was aimed at developing a method by which plastic or polymer waste materials, in this case from Qatar, could be used as valuable ingredients in developing new engineering products. "By working with industries which recycle the waste products into micron sized particles, we had direct insight into how they are used, meaning our study could be much more informed by industry requirements." Finding a new way to show industry the precise toughness of these new forms of composite concrete meant there could be more reliance on their use as a building material. Dr Antony explained how concrete made with waste plastic products had shown superior qualities to traditional ingredients, but his team wanted to ensure it could sustain service loads without fracturing. He added: "We believe this new photonic or optical approach to fracture testing could be applied not only to develop sustainable manufacturing using materials that would otherwise be discarded as waste, but also in other diverse engineering designs including mechanical, civil, materials, electronics and chemical engineering applications." The research was funded by the Qatar National Research Fund, and is published in Scientific Reports.